TOR is a well known "software" able to protect communications dispatching packets between different relays spread over the world run by a network of volunteers. Because the high rate of anonymity TOR has been used over the past years to cover malicious actions by physical and cyber attackers. TOR, especially through its browser implementation (the TOR Browser), is also know as one of the main (by meaning of the most used) way to get access to the Dark WEB in where "malicious" people buy and sell illegal stuff through dark markets. Each relay belonging to the network is able to decide if being an ExitPoint (in the following picture represented by the last machine contacting "Bob") or just a middle relay (in the following picture: a TOR node highlighted by "green cross") depending on its own configuration status. If the relay decides to be an ExitNode it will expose its own IP address to the public world; it's usually a good idea alert local police and used ISP about that in order to avoid penalties. Certification Substitution (SSL - MITM). This techniques consists in substitute the real web-site certificate with a fake one in order to be able to decrypt the communication flow intercepting credentials and parameters. Well, actually it is a pretty simple idea: "let's grab certificates, IP addresses and files without passing through TOR network (or passing through trusted circuits) and then replicate the process passing through all available relays. Compare the results and check if somebody is chaining the "ground". I am not going to publish my results since Tor Relays change over time and what I found using this script might be inaccurate and imprecise: more check must be done. Moreover it could be unpleasant charge specific relays (ergo IP, ergo owners) to be "malicious". But I am going to indorse part of results described by Philipp Winte and Stefan Lindskog published on their paper (here). 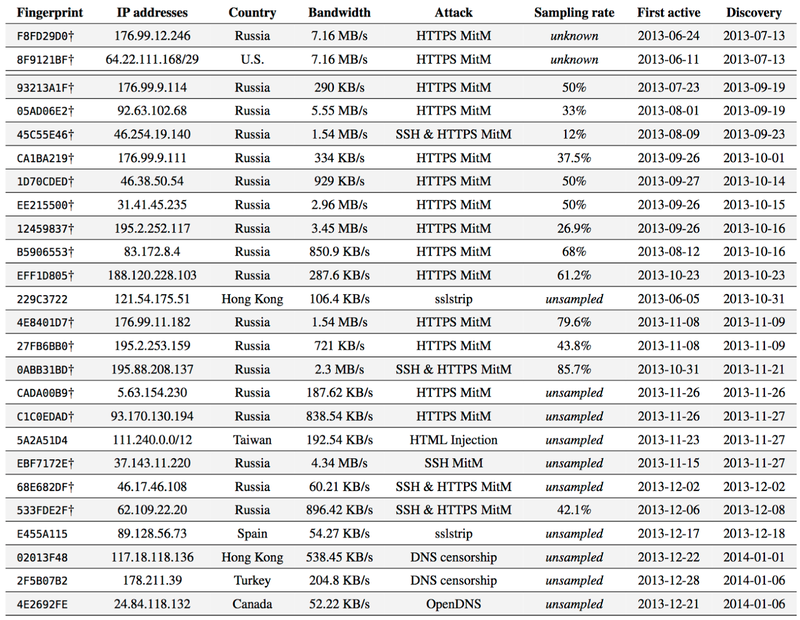 Many of the found Malicious relays have been found on Russia, Turky and Hong Honk. Not every malicious relay used the both techniques to compromise flow but almost one was found. The definitive more used technique is the SSL-Strip MITM mainly used to spy over channels. Few file patching techniques were identified. This kind of attack is useful to spread Malware over the networks and together with DNS poisoning is more used to "attack" rather then to "spy". Hello everybody, today is about speed improvements and new malware samples in malwarestats.org. If you followed the MalwareStats.org genesys you might remeber the early stage development where took between 8 to 10 minutes to visualize statistics over 43k Malware Analysis. Today it runs much better alost 15 seconds to visualize 76.2K Malware Analysis (ok, I know.. it really depends on Network speed and Computation power... but tested on the same machine you might experience a hug performance gap). 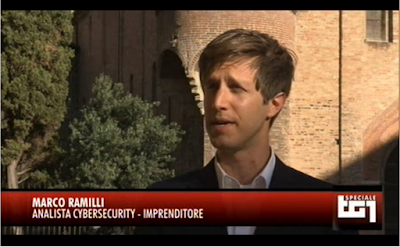 "The continued growth in number and in complexity of malware is a well established fact. Malwares are no longer simple pieces of code that rely on unsuspecting users to spread and thrive. They can change, adapt and hide themselves from analysts, using very sophisticated techniques. Static analysis is complex and time consuming, and it could be difficult to deduce every possible malicious behaviour, yet it is often very effective because it hinders the capability of malware to detect the analysis environment. 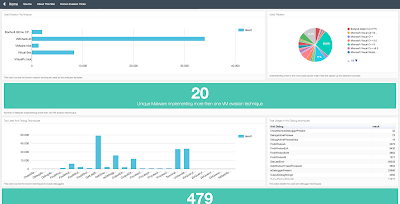 The purpose of MalwareStats.org is to provide valuable assistance to the phase of static analysis, supporting analysts in their exploration of code features, by letting them make more focused, statistically motivated and structured decisions." We are facing a "Big Data" problem. Thousands of samples produce Hundred Thousands of results, which end up to be Giga Bytes of well structured Text. And.. yes, I want to make general tatistics so far (general !== from "time frame defined") so I am not interested on filtering data (well..I know I will end up putting a time filter on the main page.. but not today!). My main goal is to answer in the quickest way to such a questions: " What are the most used packers ?" or "What are the most used evasion techniques?" or again "What are the most used API or Anti-Debbugging Techniques?" and so on and so forth. Obviusly I want to give such statistics by using a simple and intuitive web interface. You might wonder why those questions are so important for me !? Well, because they really drive my decisions during a romantic Malware analysis. The new and simple algorithm (which is not the best I can create and it is not remarkable in any point but it made a huge improvement) which made possible the huge visualization improvement from the last two versions is available here. 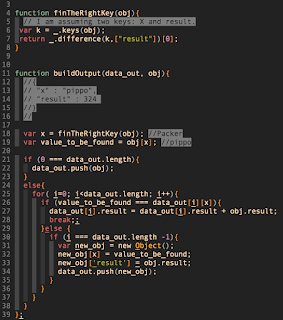 The following image shows the principal code function responsible to build the output, before passing it to google graphs. As you might agree with me the entire code should be protected (which is not protected on undefinition, null pointers, etc..) and even improved in speed introducing multiple web workers. If you like to be involved in that project just drop me an email, any suggestion is welcomed as well. Enjoy the new results ! 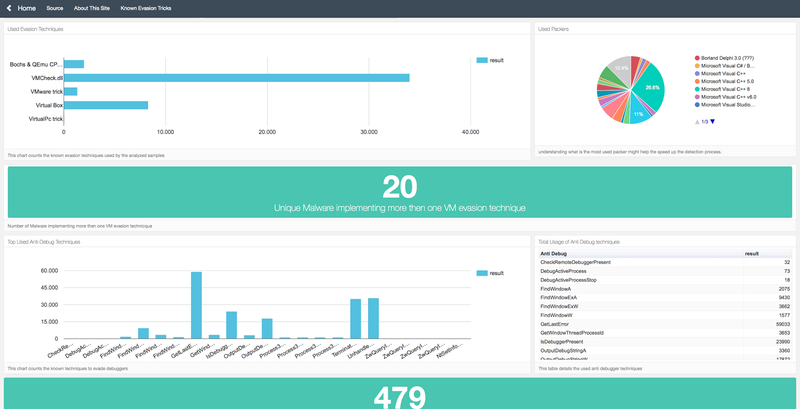 "Why are you writing about Shifu among many other new threats (even more discussed) out there ? " 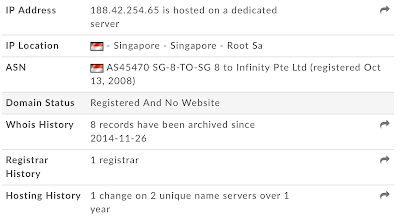 Domain Generation Algorithm (DGA): Shifu uses the Shiz Trojan’s DGA. The exposed algorithm itself is easy to find online, and the developers behind Shifu have elected to use it for the generation of random domain names for covert botnet communications. Theft From Bank Apps: Theft of passwords, authentication token files, user certificate keys and sensitive data from Java applets is one of Shifu’s principal mechanisms. This type of modus operandi is familiar from Corcow’s and Shiz’s codes. Both Trojans used these mechanisms to target the banking applications of Russia- and Ukraine-based banks. 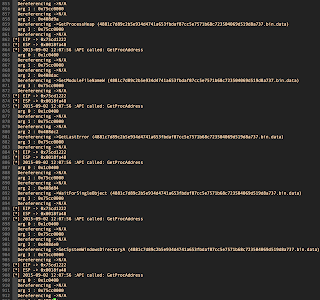 Shifu, too, targets Russian banks as part of its target list in addition to Japanese banks. Anti-Sec: Shifu’s string obfuscation and anti-research techniques were taken from Zeus VM (in its Chtonik/Maple variation), including anti-VM and the disabling of security tools and sandboxes. Stealth: Part of Shifu’s stealth techniques are unique to the Gozi/ISFB Trojan, and Shifu uses Gozi’s exact same command execution scheme to hide itself in the Windows file system. Config: The Shifu Trojan is operated with a configuration file written in XML format — not a common format for Trojans, and similar to the Dridex Trojan’s configuration (Dridex is a Bugat offspring). Wipe System Restore: Shifu wipes the local System Restore point on infected machines in a similar way to the Conficker worm, which was popular in 2009. Commuication protocol: Shifu implements an SSL communication layer based on a Self-signed certificate. The implemented module reminds analysts to the one used on Dyre Trojan campains in Late 2015. Another interesting feature is about Point Of Sales. 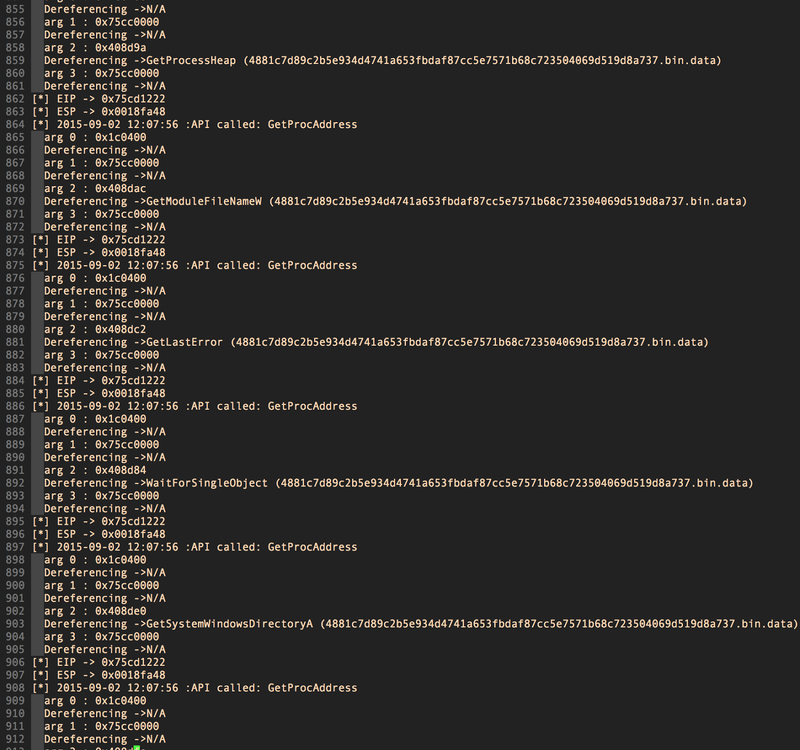 To make matters worse, Shifu searches for specific POS memory strings (and processes). If it finds a POS trace it starts a "stealing credit card numbers" procedure. 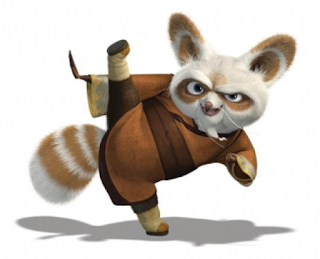 Last but not least Shifu makes sure none else will own the attacked system. Once it gets installed on the victim machine is starts an "AV" procedure (forgive me, is not actually an AV procedure, but it makes the idea) which locates "suspicious" files and denies their installation. According to IBM Security Intelligence's report (here) the Malware is likely developed by a Russian group. 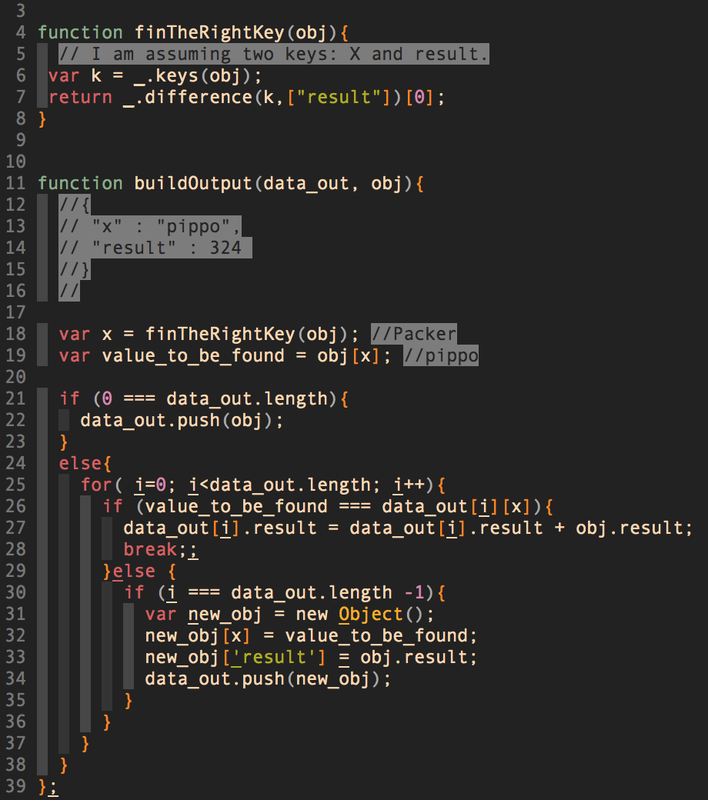 Another interesting pattern found during the simple static analysis performed phase (showed on the following image) is the dynamically loaded Library pattern (previous downloaded). As you may observe on row 2861 the system points out to a specific location and call LoadLibraryA to load it into memory. Dynamic Analysis clearly shows Sample's RAT features by spawning a shell (on my machine PID: 1388 within Parent PID: 788 owning to the executed Sample ) and executing commands. Unfortunately the evasion techniques detected the SandBox execution. The following image shows the check of Python presence, which often is one of the detection mechanisms (How many common users have Python on their Windows Machines ? Not much, really). eboduftazce-ru.com (188.42.254.65). 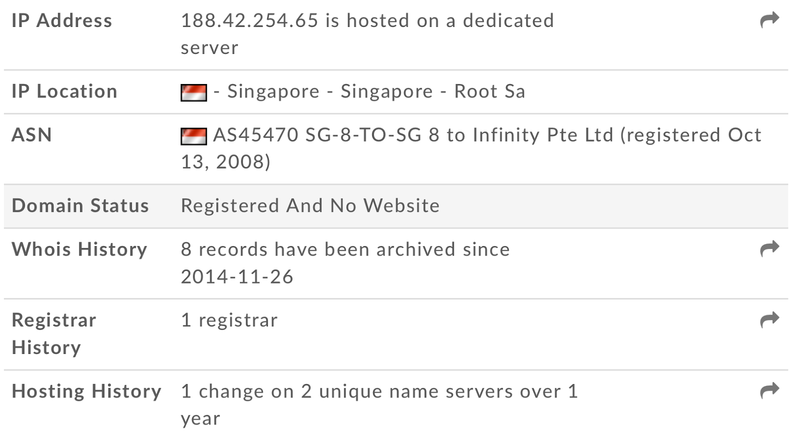 Much more interesting because geolocalized in China and the domain has changed at least two servers during the last year. Not really a significant one but the cmd.exe spawned feels like an hero. 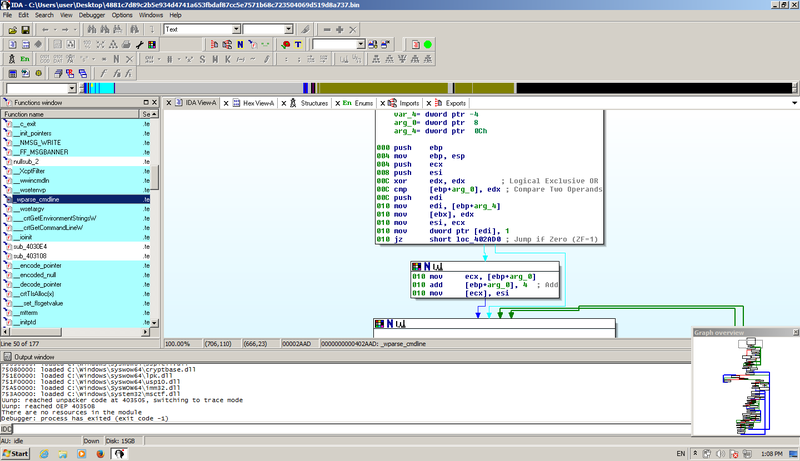 Concluding my post I wanted to impress on my pages this significant piece of Malware which embeds many different techniques borrowed from many older Malware underlining a new Malware writers skill sets, able to make harder and harder piece of code as their wish (just by adding feature from different Malwares).